For educators, students, or even design nerds, teaching/learning about the history of graphic design could be a grueling task since there is a lot of ground to cover. But not for long and you better thank the lovely folks of Pop Chart Lab for it. Apart from learning about the diverse world of graphic design disciplines, the history of graphic design also serves well as a great alternative to sleeping pills and it works really well for students. Like other design educators, I’ve also seen my fair share of students even the eager and giddy ones regardless of my loud and sometimes Smeagol-ish voice succumb into dosing off while discussing the history of graphic design. This is why I was delighted and excited after learning about Pop Chart Lab’s new poster about the history of graphic design. This does not only makes the topic easier to talk about but highly enjoyable too and not to mention I could even get one and use it as a prize for the top student at the end of the semester. A Stylistic Survey of Graphic Design is a neat concise representation of the prevalent design styles. It starts of at the top most left-hand corner with the Victorian-era and continues down to the current era which is the Flat Design. 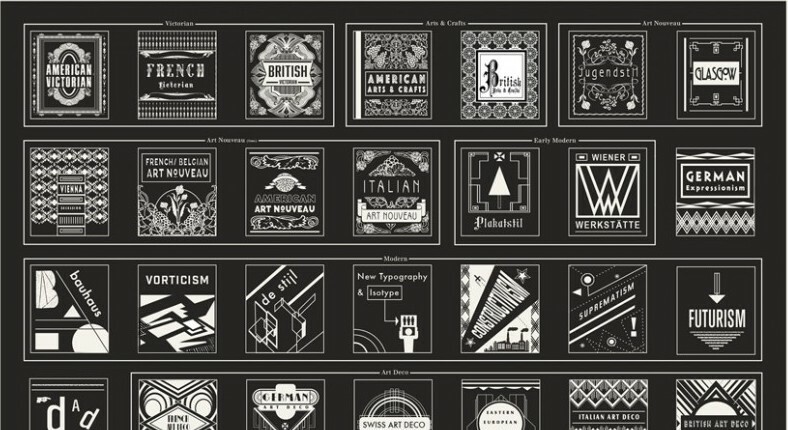 The various design styles are presented as if little square posters and are group in their respective eras through a rectangular box. Aside from the groupings it also shows us how some eras managed to last long while others are just short-lived ones. Aside from the fact that the poster is a homage to the most important eras in graphic design it also serves as a great cheat sheet for those who needs to see the defining characteristic of the various graphic design eras. Not only that Pop Chart Labs was able to place that much information into one whole poster and show which lasted and which did not. They were also able to simplify an overly broad topic that has bogged down both students and educators into something simple and easily digestible.